From the vehicles we drive, to the thermostats in our homes, just about everything around us uses coding (also known as programming). Code is the language used to tell technology what to do. You can think about coding like you would think about following a recipe in a cookbook. For any given recipe, you are given a set of ingredients and a sequence of instructions. Following a sequence of instructions is similar to creating an algorithm (or set of steps) which must be followed by a device to accomplish a task. But, here’s the tricky part, your device doesn’t understand the human language. Your device needs its own set of instructions written in a language it can understand. This is where learning to code comes in handy. Just like math or reading, coding has become a foundational skill. 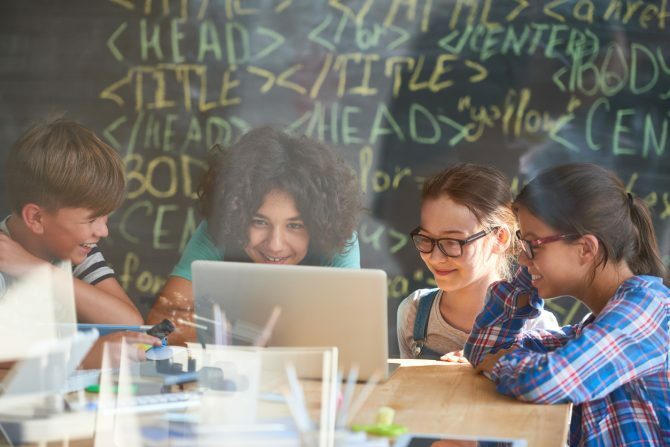 Learning about coding helps kids develop their creativity as well as their problem-solving and logic skills. Learning about coding also helps them understand the world around them. 1. Scratchopens a new window: Scratch is a program developed by MIT that allows kids to create games and animations without learning programming text. This drag-and-drop way to learn coding concepts is great for beginners, allowing children to have fun using games that subtly teach coding. 3. Tynkeropens a new window: Learn to code with Tynker's easy-to-learn, visual programming courses. Similar to Hour of Code, Tynker makes it fun to learn coding by using games and activities. 4. Made with Codeopens a new window: Made with Code, by Google, is an initiative, aimed at empowering young women to develop their programming skills. Made with Code allows you to use your creativity to create your own SnapChat filters, Gifs, emojis, avatars, music and collages, and much more, using code. 5. Swift Playgroundsopens a new window: Swift Playgrounds is an app for the iPad that teaches kids to write code in a fun, interactive way. Learn the code, developers use, to build apps for iOS by completing interactive puzzles. Visit the library to borrow books about coding for kids! You can also visit our event listings opens a new windowto check out our coding-based events, and other technology events at the Library.